Armand Guillaumin | Stoppenbach & Delestre Ltd.
Jean-Baptiste Armand Guillaumin was a French Impressionist artist renown notably for his bold landscape views of the Paris region and the South of France. Born in Paris, the artist was sent at an early age to a school in Moulins, a small village in the French countryside. There he began attending drawing classes, the village’s surrounding environment, composed of mountain landscapes will inspire his future interest in landscape paintings. Moving back to Paris in 1854, he enrolled at the Académie Suisse where he befriended artists, Paul Cézanne and Camille Pissarro. Considered a very skilled artist, Guillaumin's early work, incorporated a realist technique, which was much inspired by the exposure to artists such as Gustave Courbet. The avant-garde artist's first involvement with impressionism began with his exhibition at the Salon des Refusés in 1863 with Cezanne, and Pissaro. He was also active in the group around Edouard Manet at the café Guerbois, from which Impressionism developed. Unlike other Impressionist painters, Guillaumin had a occupation, which helped him to support his artistic career. He developed his landscape style painting outdoors in the region of Paris while employed on the Paris-Orléans railway. He frequently painted labourers and barges along the quays of the Seine. 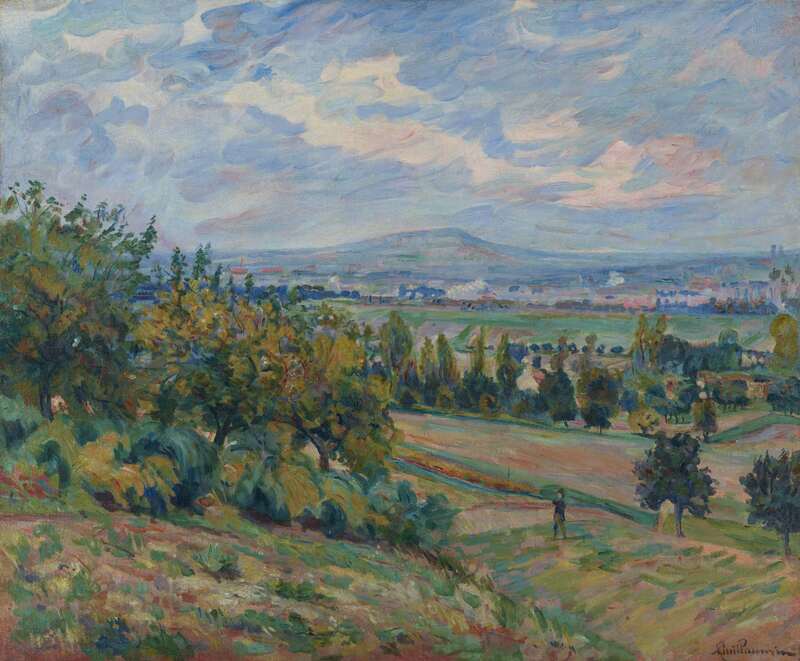 In the early 1870s, Guillaumin worked with Pissarro at Pontoise and also with Cézanne and Dr Gachet at Auvers, where Daubigny also lived and worked. Guillaumin's mature Impressionist style, combining pictorial structure and shimmering light, evolved from his contacts with these artists and their shared aesthetic views. The artist's expressive use of colour, which transcends nature in its vibrant harmonies, is also characteristic of his style. He contributed to all but two of the Impressionist exhibitions, showing in 1874, 1877, 1880, 1881, 1882 and 1886. In 1891, the artist won 100,000 francs in the lottery, which ultimately enabled him to pursue his artistic research with more freedom and autonomy from collector interest. His work, in the late 1890s, through the use of vibrant brushstrokes combined with a bold and a subtle and harmonious use of colours, will considerably influence the forthcoming post-impressionist artists. 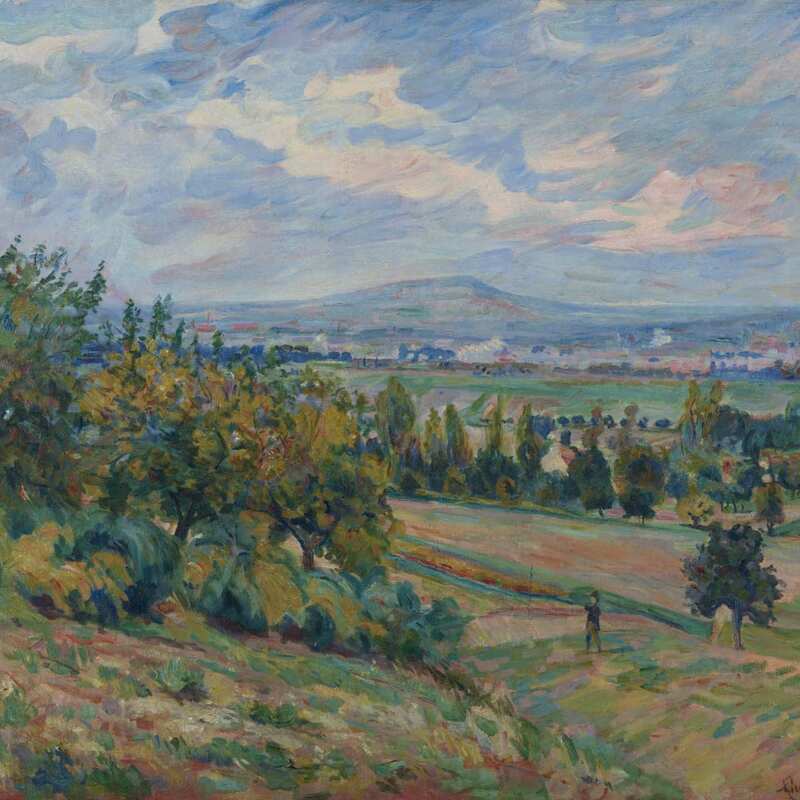 Armand Guillaumin’s evolving technique, from his early realistic period to its impressionist approach, placed him as a figure of the artistic development of the early 20th century. The artist’s work is included in numerous collections around the world, such as Musée d'Orsay, Paris ; Tate Britain, London ; Metropolitan Museum, New York; Montréal Museum of Fine Arts ; Thyssen-Bornemisza Museum, Madrid.